So as I stated last week, we're going to delve right into the TOP TRENDS FOR FALL 2009. I'm really behind on this post but it has not even been a week since the 1st day of Fall has arrived. Let's get to it! First up, we're going to cover Fur, but you know real fur is really expensive so I'm going to offer only affordable finds. Faux fur is still awesome it just takes choosing the right brand to make it look high quality. 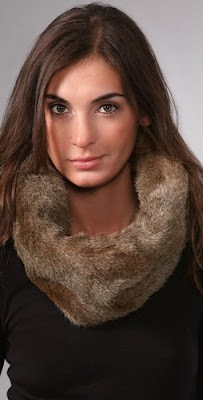 Fur stoles and wraps seem to be the styles that are coveted this Fall. Check out Rihanna's classy look with her gorgeous black stole pictured here in Venice this past weekend. I love the Fall look! The black and maroon colors look great. The above style is referred to as a loop......for obvious reasons. I really like this jacket. 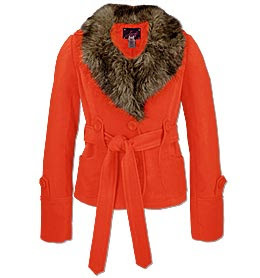 The color just pops against the brown faux fur around the collar. 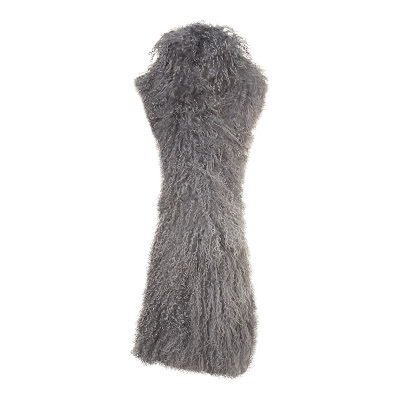 Now I'm more than likely going to get a fur scarf. I don't foresee Florida providing the need for me to have anything more. Although, lately our winters have been getting colder. This is a cute little skirt. Pair with black tights, a top, and one of the season's trendy blazers for a super cute look. I love the iridescent look of this faux fur coat. It does slightly resemble the Snow Monster in the classic Rudolph the Red-Nosed Reindeer story but I still think it's a winner! Stay tuned tomorrow for our coverage of creative tights and leggings!